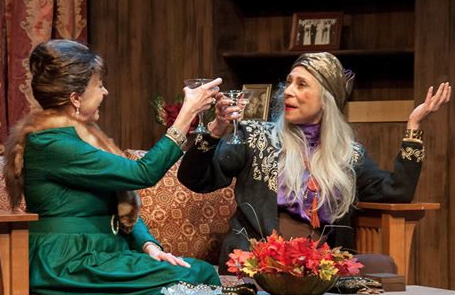 As drawing room comedies go, you can’t get any better than Noel Coward’s “Blithe Spirit.” As productions of “Blithe Spirit” go, you can’t get any better than the current one playing at St. Louis Actors’ Studio. All of the wit, charm and bubbling humor come across from the deft and delicious cast with director Bobby Miller bringing out every nuance of this absurd yet somehow plausible scenario. Charles and Ruth Condomine are awaiting the arrival of their guests, Dr. and Mrs. Bradman as they plan to hold a seance with Madame Arcati so Charles can gather research for his latest novel. The small talk turns to Charles’ first wife, Elvira as Ruth grills him about how he compares her to his “dearly departed.” Madame Arcati is not aware that she is there for merely observation in the hopes that Charles can expose the fraudulent side of mediums so she goes full swing into the seance. With Elvira fresh in his mind, Charles unwittingly brings her back but he’s the only one who can see or hear her. Throw in a addle-brained maid, Edith, and you’ve got the makings of a first-rate English comic romp with proper stiff upper lips and genteel manners. The ensuing events over the next few days are remarkable indeed with a wild and wooly finish that any ectoplasm would be proud to take credit for. When done with skill and aplomb like the STLAS production, it is the height of entertainment with the effervescence of bubbly champagne and crackle of subtle and sublime English sophistication. Leading the way is the multi-talented Michael James Reed as the marvelously pompous Charles. He tosses off Coward gems and sparkling nasty comments with the greatest of ease while always maintaining the demeanor of the proper English gentleman. The equally adept Nancy Bell hovers about and trades sarcastic remarks to a fare-thee-well as the wispy Elvira. Holding her own with these two battling exes is Lee Anne Mathews as Ruth. Incredulous at the circumstances and her inferiority complex toward Elvira combine to make her go “raging harpy” on both Charles and Elvira. Absolutely riveting every time she enters is the delightful Nancy Lewis as the outrageous Madame Arcarti. Rapidly moving her body and her mouth from one subject to the next, she never stands still. Even when she’s in a trance, it seems she can’t control her need to sprawl, wave her hands about and marvel at her own talents. It’s a remarkable performance that will astound you with its flights of fancy and frenetic behavior. Steve Isom is solid as the no-nonsense Dr. Bradman who appears to be convinced of Madame Arcati’s talents when she manages to tip over the seance table and send them all sprawling. Andra Harkins is the proper British housewife as Mrs. Bradman who is fascinated as well with the unexpected events that result from the seance. Rounding out the cast is a wonderful performance by Jennifer Theby-Quinn as the maid. Though presented at the outset as broad comic relief in a comedy that’s bent on sophistication, she becomes a key player later in the play. Bobby Miller’s direction is flawless. 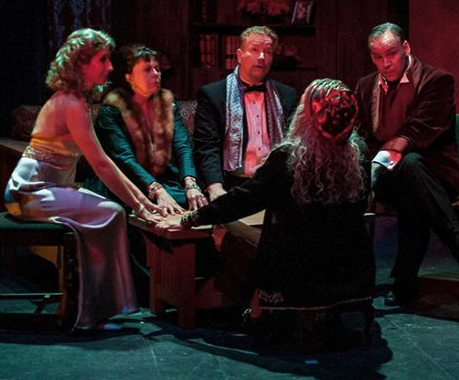 Despite being a typical three-act comedy, the time flies by as the beautiful prose and unforgettable plot twists of Noel Coward propel “Blithe Spirit” into the stratosphere. Keeping it taut and to the point, Miller has brought us a comedy for the ages in the way it was meant to be seen. The Patrick Huber set design is wonderfully clever and efficient on the small stage and his lights also enhance the proceedings. Michele Friedman Siler has costumed the show impeccably complete with smoking jackets and sparkling gowns that keep with the spirit of the play. Mark Wilson provided the special effects that particularly come into play during the final scene. And Bobby Miller also kept us older folks in the audience guessing with his delightful sound design featuring music from the period but not necessarily always from artists of that period. 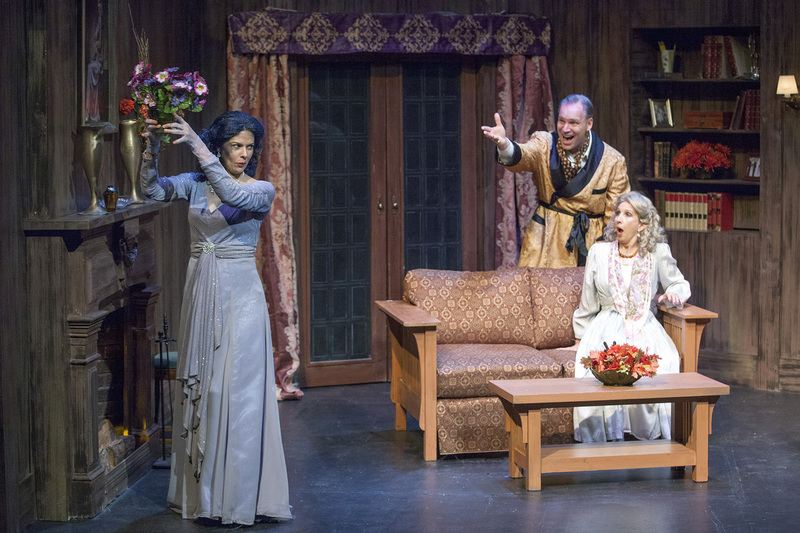 “Blithe Spirit” doesn’t come along very often on local stages so you must make an effort to see this production. It is handled with style and class befitting a work and playwright of the stature of Noel Coward. I’m still waiting for someone to produce the musical version, “High Spirits” that has a sprightly score matching the wit and sophistication of the original work. 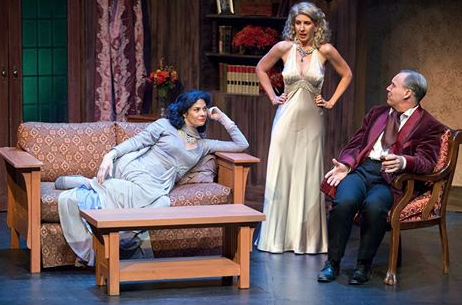 But right now, the St. Louis Actors’ Studio version of “Blithe Spirit” is about as good a play as you’re going to get anywhere in town. See it through December 21st at the Gaslight Theater. Call them at 314-458-2978 for tickets or more information. This entry was posted on December 10, 2014 at 9:43 pm12 and is filed under Uncategorized. You can follow any responses to this entry through the RSS 2.0 feed. You can leave a response, or trackback from your own site.